This poem is an affirmation of my belief that life is worth living and that no matter what good things we’ve experienced, it’s likely that God still has new and better things in store for us. The laudation of hope seen here is not meant to undermine the place of faith in the life of the believer nor is it a call to disregard the words of Solomon as recorded in the Bible. Every verse of scripture is best understood in its proper context if we will be enriched by it. Read, comment and share widely on your social media platforms. You are richly blessed in Jesus’ name. For what is life without hope? What is life without anticipation of the newness it will bring? What had happened to the great king? Thank you so much, Penny! Glory to God! Have a beautiful day, everyday, in Jesus' name. This poem portraye the importance of an individual putting their hope in God no matter their situations and difficulties in life. Hope gives birth to results if someone doesn't give up. You're right! That is why the Bible says "hope maketh not ashamed", meaning that our hope in God does not disappoint us. May you see God do amazing things in your life in Jesus' name. Beautiful! With respect to faith, it is my opinion that hope keeps faith alive. The two are not rivals nor are they mutually exclusive. Rather they both need and compliment each other. A well versed and written poem. Thanks a whole lot, Ziri! So glad you came by. Glory to God for the poem. I hope it encourages some people. You are blessed and blessed in Jesus' name. This poem is an awesome one. Although life gives you all that it takes to live, one still needs to pause and use it wisely. Solomon, the wise king, accumulated all he needed but at a point, he found it all to be tasteless and vanity. Life can be tasteless at a point but one needs to encourage oneself and live on. Wow......interesting poem. As a Christian, we should try and bring God into our everyday life. We should also appreciate his works and no matter how little you think he gave you, try and be appreciative. Also, we should be happy with what we have and don't envy others. 'As long as you have life in you,never say there's nothing to look forward to'.... Some people contend that love is the greatest gift of all. I believe it is hope. Really what is life without hope? what then will all our dreams and aspirations amount to without the rare gem that is hope?. To lose hope is to lose joy, to lose hope is to forsake happiness, to lose hope is to forfeit life. Oh Aunty Edith! you have not the slightest inclination, not the faintest clue what your poems of hope and faith do to me. With every poem of hope that you write, i fall in love with you all over again. You may probably think i'm over-emotional but even as i write this, the tears of gladness just won't stop flowing. Ma'am, my greatest fear is for hope to elude me. It's a fate i could never wish on anyone. I could read poems of hope all day if the pressing matters of this world let me. I'm thankful, ma'am. In no small measure am i thankful. Praise the Lord! The three virtues - faith, hope and love are all important and work interconnectedly. The Bible tells us that faith works through love and that our hope does not disappoint us because the love of God is shed abroad in our hearts. So you see, as the Bible says again, love is the binding tie for all three. You are splendidly blessed in Jesus' name. I love this poem, it shows that we need to work hard for our future, because there is one adage that said that, heaven help those who help themselves. King solomon is a very hardworking man, through his hardworking God bless him, so it shows that we need to word hard for God to bless us more and more. Sweetie, the most important thing the poem is saying is, "Never lose hope.' Cheers! wow! I love this poem. Its all about hope which is the virtuous desire for good. As a christian, we are also meant to have faith in God because Faith is the ultimate needed in a Christian's life. we should also be hardworking, for Faith goes along with work. Actually, we are meant to have faith, hope and love but love is the greatest because the other don't work well without it. Have a fruitful week, Chidubem, in Jesus' name. Nokia 3310, lol! So much to look forward to as long as there is life, praise God! "As long as you have life in you, never say there's nothing to look forward to." Amen! I love these words, Edith. The world needs hope. And Hope, as we are blessed to know, is Christ Jesus. Praise God! Hallelujah! Thanks you so much, RebeccaLynn! It's always a pleasure to hear from you. thank you ma for rekindling my faith in God. fabulous post. Living your life without hope is meaningless; hope pushes you to do more and also to give it your all. Once you have hope and faith in God,you will always be encouraged to give life your all in all that you do. Like the saying goes, once there is life there is always hope. This poem is really encouraging because hope is one of the special attributes one needs to adopt, reason being that with hope one can conquer or rather achieve many things. You might be stretching things a bit there. Hope is the expectation of good in the future. Hope is the foundation of every true christian. Why do i say this? it's because we all hope in christ and in the kingdom of God that has been promised in the bible book of Daniel. Hope is what everyone has. We all have hope in something or someone but regardless of whatever we put our faith or hope in, we must remember to hope in the Lord. Is it really true that everyone has hope, and faith? That would really be nice. But I do agree that it is best to put our hopes in God. This is an inspirational poem. Our responsibility is to have faith and hope in God, God`s own responsibility is to bless us infinitely . Therefore, do not be like Solomon, who felt tired and bored to appreciate God for his riches and wealth. God bless you ma. this poem i must say is awesome, hope keeps us going even in trials and difficulties of life,hope sustains us,it is only a dead man that dosen't have hope for as far as there is life,there is hope. Exactly! Hope introduces totally new dimensions to life. A life void of hope and expectstions is really boring and bleak. A life void of hope can be said to be boring and lacking spice. because hope opens more new dimensions to life. Nice work ma. New inventions only tend to excite for a while, but hope really provides for a pleasurable and meaningful life. This poem emphasises on the saying that where there is life, there is hope. I agree with the poem because it passes a secret message to me. Thank you ma. What a motivational poem. We should know that the future has good plans for us. So, we should live in hope because wonders to come are better than wonders that had passed. Hope and faith are forces that push us toward achieving great, especially when things of this world try to weigh us down. #living in anticipation of new things life brings# are now my watchwords. Thank u Ma u are really an epitome of God's instrument, used for invigorating the enervated hopes of individuals who come across this blog. Awesome! This is indeed a motivational poem which enables us to know the need of having faith and hope in everything because once there is no hope, there will be no life. This is beautiful! Truly, the world has a lot of mysteries yet to be discovered if only we take it a step at a time. Pride is an ingredient of destruction and failure. We should not be carried away by pride when the almighty God lifts us up. Wow.....interesting poem. God is the giver of hope where there is no hope, no matter what one is passing through in life. Wow! This is beautiful! Life always and will always have something new that we are yet to know about. There are still wonders that God has in store for the ones who believe. But then, I leant that in as much as some may be blessed abundantly like King Solomon, we ought to take life easy and slowly and enjoying every good thing that the Lord has brought to us. There shouldn't be any anxiousness to get them all, else we might say life is meaningless like King Solomon. Kudos! So, whenever wonderful things happen in our life, we should always appreciate and hope in Him to do something better. And He will. Exactly! We need hope in our lives so we don't say life is meaningless like Solomon. Hope is the light of every individual, it gives us the courage to go on; especially when we hope in something as strong and trustworthy as God! When all seems to be lost...we can only look up to God. Him alone can give us eternal peace of mind. WONDERFUL.Life has a way of showing us there are more things to life than we see. H.O.P.E they say stands for Hold On, Pain Ends and that is exactly what this poem reminds me of life will always be challenging but hope will always be that tiny voice that whispers hold on. I like the poem as a whole but I fell in love with its last stanza because, the writer was able to encourage her readers and also acknowledge God, shining the light on the fact that our hope should be in God only. Thoughtful words indeed ma. truly, when there is life, there is hope. mostly if we believe in God and serve Him. People seem to give up quickly when they undergo hard and trying times. This write up is an eye opener to everyone. God bless you ma. I love this poem for it teaches us to forget about the past and look up to the future. for tomorrow may be brighter than yesterday. As a christian we have to look up to God for a better tomorrow. Wow this is actually an encouragement. No matter the situation, we should continue to hope and trust in God. Striking because some people out there fail to understand the many and new things life have in store for them. They feel they have it all. Good one, i like this poem. in any condition we are in life we should try and have hope because hope keeps us going. It all centres on patience, it centres on appreciation and being contented with what you have. Never allow envy, jealousy and conflict to bring us to our Waterloo, but rather have patience and wait for the right time. I duff my hats for this ma. It's indeed inspirational. Wow..what a nice poem which talks abt hope bt we shouldn't just relax and keep hoping for miracles to happen,we have to work hard, anticipate, and also have something to look out for and then with faith everything would fall into place. Wow! Iove this poem. It potrays the need for we Christians to live in hope and also to appreciate and be happy with the things God has done for us without turning our backs on him. The poem portrays hope in God and also faith to sustain it. Hope is the virtuous desire for future good. Therefore, we cannot be fulfilled unless we hope on something and we are not fulfilled unless we get fulfilled in God who is the hope of all creation. Hope and trust in HIM is a strong factor in our faith. He doesn't disappoint-EVER!!. when life deals you a blow..don't go down-utilise it. We should always know that there is hope as far as there is life. We should always have something to look unto that will always renew our hope. Remain blessed, ma. Sometimes in life, one does not have any choice but to hope, trust, have faith and believe in God and something miraculous will happen. My spirit just got lifted up. The poet is right! there is always something new under the sun if only we can open our mind to behold and see thousands of great possibilities that exist in this world, because when we do, our limitations to ourselves will cease. We have hope, because we have life. However tough, our hope in the creator of the universe will never waver. He knows all of our problems and he'll answer us in due time. Thank you for this poem ma. When there is life,there is hope. Our creator has our backs, for what then should we panic? Three gifts the Lord gave to us- Faith, hope and love. He told us, through the scriptures that he is with us, even when we walk through the fire. These truths are enough to keep me going, even in bad times. No matter the situation, there is always hope for us, as God would never forsake us. HOPE for survival is what keeps humans alive and makes us succeed even when the journey of success is difficult. hope of winning gives us the strength to continue the journey of life. We should all emulate the character of Lazarus, his hope and faith towards God even in his condition, we should understand that tomorrow holds so many promises, for the gift of life is a reason to be hopeful. Emmanuel:God is with us No matter what we should have hope for a better tomorrow. Once there is life there is hope.. I believe that HOPE is a necessity for all humans, that moment we want to give up we remember this word (Hope) which whispers silently to our ears making us not to give up. Giving up is only for failures for if you want to be successful we fall and rise again and that rising again is Hope...God is the generator of Hope. Thank you Ma for reminding us to always live in hope. Life is meaningless without hope. Amazing poem! Life has a lot to offer. Lets take away the doubt and speak positive, believe in the future and hope for the best. Life is a mystery and only the brave and courageous can survive. This is a message of life. Thank you ma. hope keeps even the most unfortunate of persons going and smiling. it gives us all something to hold on to when everything is just tough. I have hope in the almighty God. He is the one that I live for and he is the reason I live. My hope is built on nothing else than in Christ Jesus, his blood and righteousness. Never give up, as long as you are living there is hope for you. In any situation we find ourselves let's bear this is mind something good can still come out from that situation. Don't lose hope but stay focused. No matter what a situation looks like, it is important for us to be hopeful. It makes one look forward to a brighter tomorrow, it makes one work towards achieveing a better tomorrow. Even as Christians our life depends on hope..as Christ is our hope of glory. We should not relent on whatever good we are doing, because there a rewarder who rewards every man according to his deeds. Wow, very nice, living in hope is the best, hope keeps faith alive, living life without faith is meaningless, its really inspirational. Interesting ma. I strongly believe that when there is life, there is hope.This poem helps us understand that we should always have a positive mind in what ever we are doing. May God continue to bless your handwork ma. As Christians,we should learn how to live in hope.In as much as there is life, there is hope. No matter any situation we found ourselves,we should learn to know that is not the end of the world.when we rise and fall,it shouldn't discourage us but encourage us to do better.what a wonderful poem ma. Hope comes with faith, and its not also by hoping we also workhard to fulfill our hopes. God is always there for us and reaching out for us, that's if we have hope. Hope is very important! On course... There new ideas to exploit, life is full of possibilities but we are meant to do these exploits with our creator, the author and giver of life. unless the Lord keeps watch, futile is the watchman's job. Since there life, there is hope. We have to believe that there is nothing hard for God to do, one thing every child of God need to have is hope and never give up on anything you want, just have faith in God. As long as you have life in you. Never say there's nothing to look forward to. Yes, I believe. Hope in God, be of good courage and he shall strengthen your heart. Interesting piece! Hope is really salient in the life of Christian because with it u can trample all the obstacles. When there is life there is hope. Hope and faith work hand in hand. God is hope and he will always be there for us and will never forsake us. Having hope is one of the best thing that can happen to us because when you have hope, you hardly give up. Hope becomes your strength, even when things and difficult and are not going as planned. Always have hope and believe in God for an upliftment. Having hope is very important in every Christians life, when we have hope ,our problem is half solved for it is said that the future have better tidings for us. Hope keeps us going all the time. Do we wonder why those who commit suicide make the decision to do so? Because they have lost all hope. While having hope, we should learn to fix our hope in the right source, we should place our hope in God and not in man for He is the author and finisher of our faith. As long as we have hope, we have a tomorrow. Let's learn to live life one day at a time. WOW! I never knew this side of Solomon. No matter how everything seems meaningless like the case of Solomon, there is always something new because "life is infinite". This poem is thought-provoking, There always comes a time in our life, that we feel depressed, it seems nothing is working,because of this, people commit suicide but if we can have faith in God and hope for a better tomorrow, we will realize that life is worth living. As for me, as long as God exist my tomorrow must be greater than my yesterday. The saying "when there is life,there is a way", hope is the foundation most Christians are yet to find because without hope,there is nothing to live for. This poem draws our attention to putting all our hope in GOD and how it would eventually make one successful in whatever they do. Hope keeps faith alive. The poem is really great. When life seems bad, always encourage yourself by having hope. A man without hope is dead, for what is life without hope? There is always something new under the sun. Just look closely and keep hope alive. I love this. This is so true and very powerful. 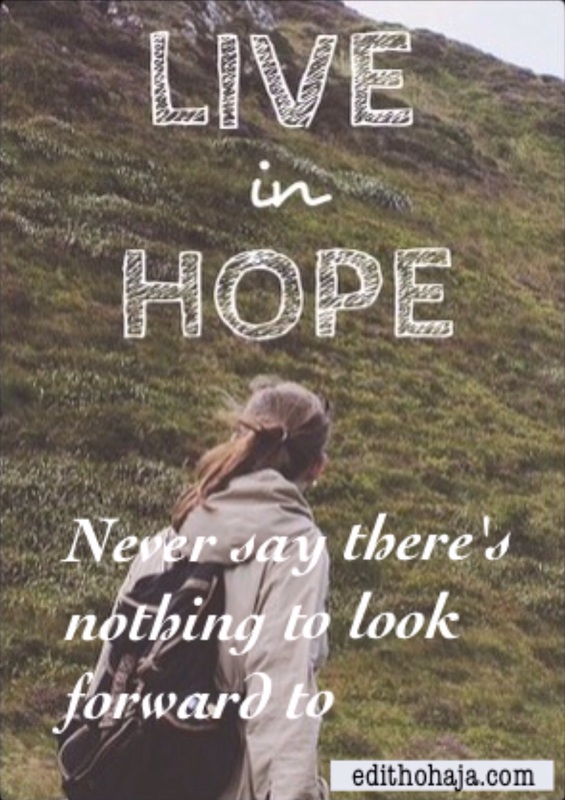 There is always hope and we must trust in the Lord in all the situations of our lives. God bless you. Hope is believing that the future would be better. Hope keeps us going, it gives us a reason to live. It also encourages the weak and challenges us to do better.